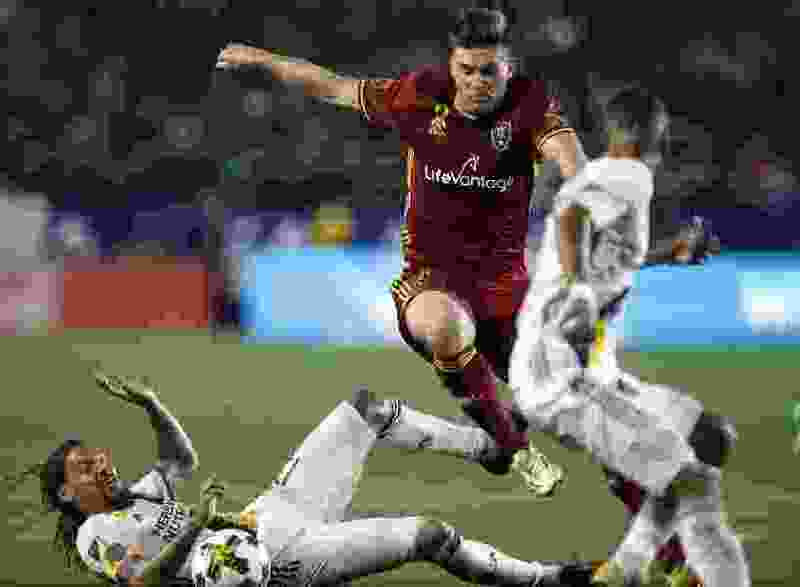 (Alex Gallardo | Associated Press file photo) Real Salt Lake defender David Horst, center, leaps over the tackle by Los Angeles Galaxy midfielder Jermaine Jones (13) to get to the ball during the second half of an MLS soccer game in Carson, Calif., Saturday, Sept. 30, 2017. After an 11-year career in Major League Soccer, Real Salt Lake center back David Horst announced he is retiring. Horst broke the news on his Instagram account Wednesday morning. He spent a total of five years with RSL, including the last two. His contract option for next season was declined by the team. Horst suffered a fully ruptured right Achilles tendon in late June that kept him sidelined for the remainder of the 2018 season. He played in five games and started in three this past season. Horst said when RSL informed him it would go in a different direction because of his injury history, he took it as a sign that it was time to hang it up. Horst plans to pursue coaching as his next venture, he said, either in the youth game or within the RSL organization. He has worked privately with various youth soccer players, he said. Horst spent much of his second stint with RSL mentoring some of the younger players. He said veterans like Kyle Beckerman, Chris Wingert and Nat Borchers helped him when he first entered the league, so he wanted to pay it forward. The 33-year-old had signed with RSL as a free agent in January 2017. He spent three seasons each with the Houston Dynamo and Portland Timbers before that. RSL drafted Horst 14th overall in 2008. He was on the team that won the MLS Cup in 2009. Horst said those two events were highlights in his career. He was also on loan with the Puerto Rico Islanders for seven months in 2010 and won the Caribbean and USL championships. Horst played in 148 games in the MLS — starting 129 — and scored five goals while adding four assists.